These digital materials complement our Curriculum Toolkit and are made possible by generous support from the California Civil Liberties Public Education Program, the Henri and Tomoye Takahashi Charitable Foundation, and individual donors. 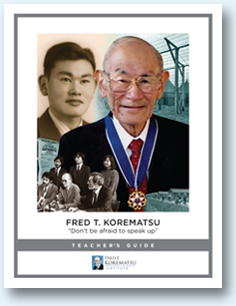 Accompanying the Toolkit’s Curriculum Films DVD, these digital-only lesson plans explore the Japanese American incarceration through clips of six films: Of Civil Wrongs and Rights: The Fred Korematsu Story, Rabbit in the Moon, Conscience and the Constitution, A Bitter Legacy, Resistance at Tule Lake, and Relocation, Arkansas. Including Incarceration Camps Handouts For Lesson Plans. This is the digital version of the Curriculum Toolkit Teacher’s Guide, plus a digital-only packet of handouts to be used with the camps lessons. Patriot Acts tells the powerful stories of men and women who have been needlessly swept up in the War on Terror. In their own words, narrators recount personal experiences of the post-9/11 backlash–from rendition and torture, to workplace discrimination and bullying–that have deeply altered their lives and communities. This is the digital version of the booklet contained in the Toolkit. Print out a classroom poster using this jpg. This 12-slide PowerPoint presentation, with slide notes, walks students through the history of the Japanese American incarceration, from the Pearl Harbor attack to Executive Order 9066 and life in the camps. 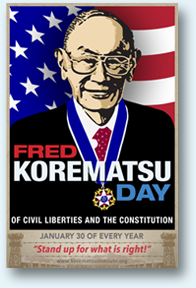 It incorporates the 24-minute version of Of Civil Wrongs and Rights: The Fred Korematsu Story (included in the Toolkit), as well as discussion questions and archival photos. These PowerPoint presentations provide details on the sites where Japanese Americans were initially detained, before being forcibly moved to long-term concentration camps.